That’s when my download allowance is renewed and I can resume my ranting. Meantime, I notice I promised to reflect on blogging but instead have given you yet another blog! In fact it is my old Blogspot number revived with a niche purpose that would be swamped here, yet does not quite belong on English/ESL either. And those promised reflections? Well, just this: a blog is what it will be. Mine is a 21st century commonplace book, no more and no less. No other purpose. Just a voice, a collection, a series of letters to whom they may concern. What more do you want? Overnight Sitemeter visitor #140,000 arrived here from Columbus, Mississippi. That is, the 140,000th visit since Sitemeter started counting on one of my earlier Floating Life manifestations, back in July 2001. The next milestone to note is coming up soon: #95,000 to this blog in particular — WordPress count. Mine is a 21st century commonplace book, no more and no less. No other purpose. Just a voice, a collection, a series of letters to whom they may concern. What more do you want? I have started a new blog because I want to recapture that simple purpose. Sitemeter now registers 700,000+ visits, almost three quarters of a million in fact! So I have decided on a fresh start — not the first time, as regular followers will know. But there is a reason. I wanted to cut loose from the “obligation” of City Daily Photo, and I wanted to not even pretend to have anything much of note to say. This blog will be much less ambitious. It really will be a commonplace book. For example, many future entries will draw on the treasury of my eBook library simply via quotes and minimal contextual commentary. There will be reviews, again quite minimal, of things I read or see in other ways. Or hear. The massive music library that came to me via G through M and Baby HP will no doubt lead to an entry or three! My blog will really be to give me pleasure, not to change the world. Right now I am catching up on reading, thanks to Wollongong Library, The Girl with the Dragon Tattoo. It really is as good as everyone has said! 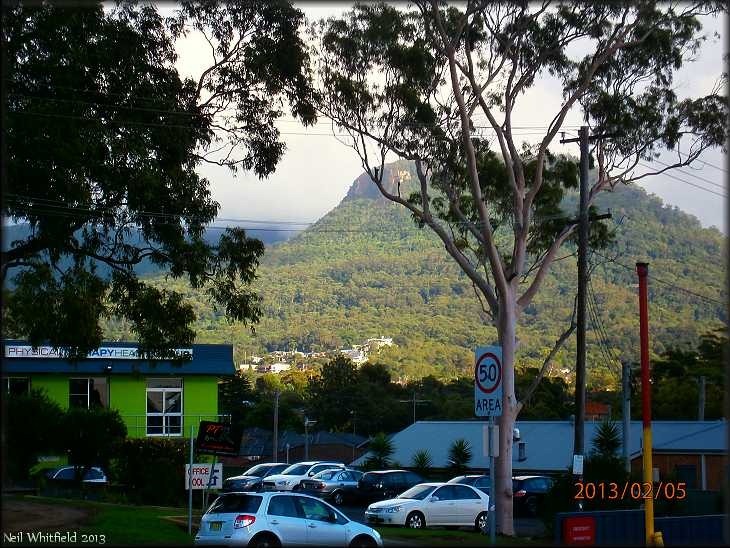 That’s how Mount Keira looked as I walked home from the Yum Yum Cafe. Not too bad, eh! This then is the last entry in this blog. From now on go to Neil’s Commonplace Book. Since yesterday it has been cooler here in West Wollongong, but we still get great skies. These were taken around 7.30 am. Using Funny Photo Maker, variations on the view from the Sydney train last Sunday morning. Note the Sydney Boys High brolly in the bottom picture – still going strong after seven years. See City Daily Photo February Theme Day – Umbrellas for more entries. That can’t be January 2013 gone already! I did wonder who St Spyridon might have been. The church in Gardeners Road Kingsford and the school next door are quite impressive.